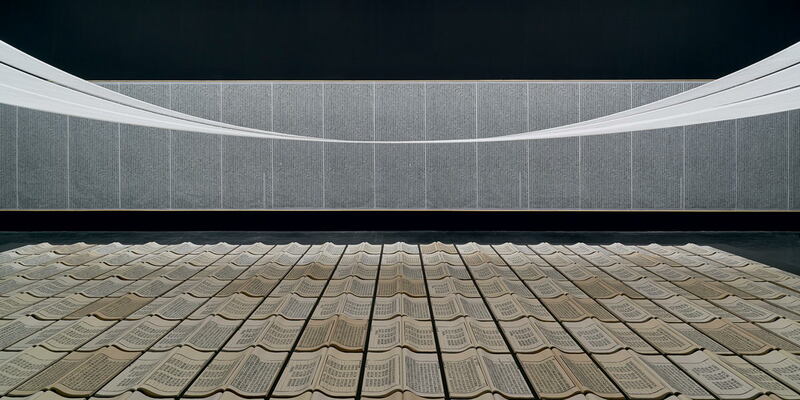 Book from the Sky by Xu Bing, mixed media installation, dimensions variable, 1987-1991. In 2007, the work joined the opening exhibition of UCCA. Eleven years later, it is exhibited at the same place. 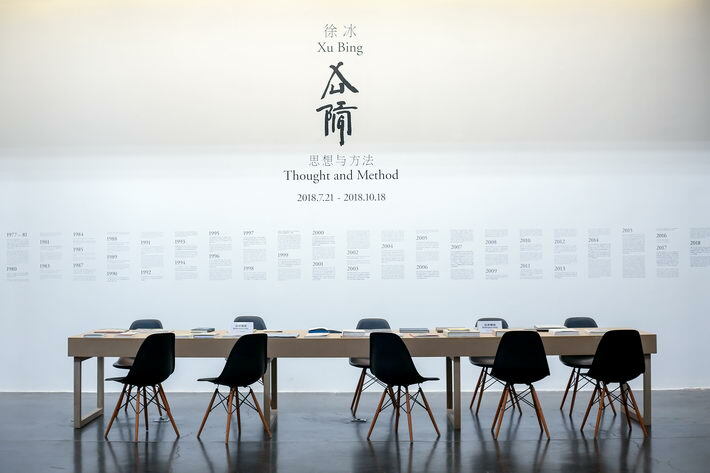 From July 21 to October 18, 2018, the Ullens Center for Contemporary Art (UCCA) presents an exhibition titled “Xu Bing: Thought and Method.” This exhibition marks the most comprehensive retrospective solo show of Xu Bing, a Beijing-based renowned Chinese contemporary artist. It is the culmination of his artistic career spanning more than four decades, featuring more than 60 works including prints, drawings, installations and films as well as documentary footage and archival material. One of the most influential Chinese artists on the international stage, Xu Bing has made a profound impact on the history of Chinese contemporary art with his avant-garde works and wide-ranging practice. UCCA Director and CEO Philip Tinari believes Xu is not only the most representative icon of Chinese contemporary art but also a key figure for global contemporary artistic interlocution over the past half a century. According to Tinari, the title “Thought and Method” expresses UCCA’s desire to provide a systemic overview of Xu’s notions and methodology in art creation, as well as the motivation behind his unceas­ing inquiry. Out of the exhibition hall, UCCA provides a rich literature of Xu Bing’s work for audience to read. Words on the wall briefly comb through Xu’s works in a timed sequence. The exhibition starts with Xu’s early masterpiece Book from the Sky (1987-1991) which took four years to complete. The piece is a four-volume treatise carved with thousands of meaningless Chinese characters, each designed by the artist in a kind of typeface font originating in the Song Dynasty (960-1279) and standardized by artisans of the Ming Dynasty (1368-1644). The volumes are manually bound like ancient Chinese books. Monkeys Grasp for the Moon by Xu Bing, 2001. In 2001, Xu Bing was invited to hold an exhibition at the Arthur M. Sackler Gallery in Washington D.C. Monkeys Grasp for the Moon spanned the entire height of the gallery’s atrium, where it eventually became a permanent installation. This exhibition displays part of the work. This work serves as the introduction to Xu’s “Thought and Method.” Text is normally used for reading and conveying literal meanings, but Xu’s Book from the Sky is marked by illegible character-esque writing. Xu Bing wanted these “fake Chinese characters” to challenge people’s inert thoughts and drive them to doubt their available knowledge system. Book from the Sky debuted at the National Art Museum of China in October 1988 and quickly caused a sensation at home and abroad, consolidating Xu’s reputation and academic status in the international art circle. 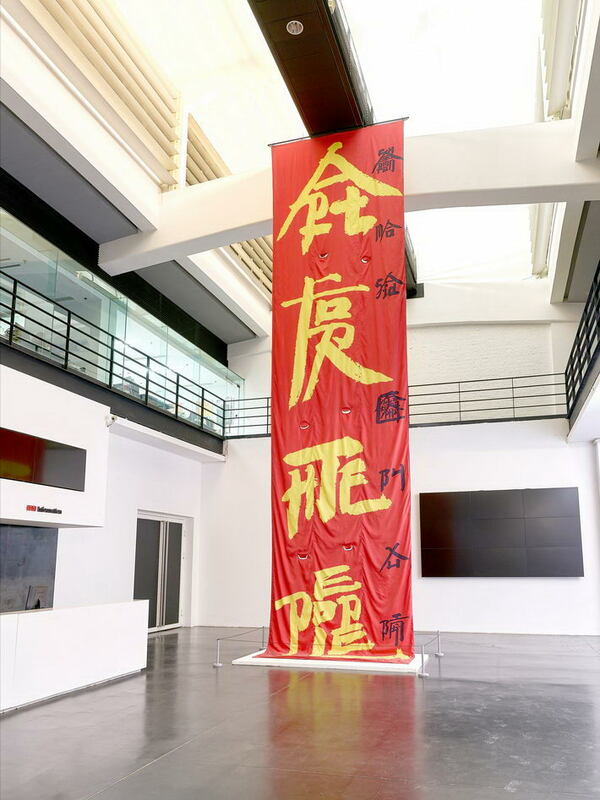 Returning the work to UCCA is especially meaningful because it was displayed at UCCA’s opening exhibition “’85 New Wave: The Birth of Chinese Contemporary Art” in 2007 in the exact same space. Exploration based on writing systems has remained a central theme of Xu’s production. Back in the early 1990s when Xu first moved to the United States, his greatest challenge was communication. 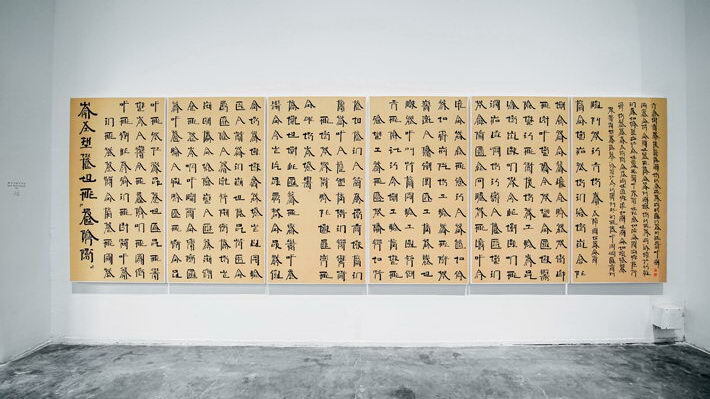 During his experience of the cultural collision between the East and the West, he began creating Square Word Calligraphy (1994-present), a refashioning of the English alphabet according to the structural logic of hanzi (Chinese characters). Square Word Calligraphy by Xu Bing, 2017. Back in the early 1990s when Xu first moved to the United States, he began creating the Square Word Calligraphy series (1994-present), a refashioning of the English alphabet according to the structural logic of Chinese characters. 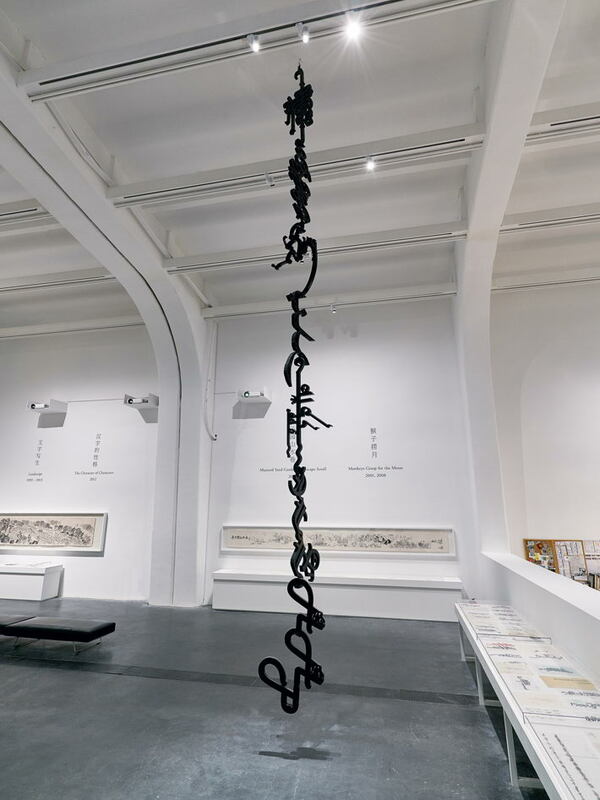 Contrasting his “fake Chinese characters,” Xu’s Square Word Calligraphy can be read, combining Chinese calligraphic art with English writing to create a new “species” that poses questions for people from both cultures. In 1999, Xu Bing was awarded a MacArthur Fellowship, popularly called the “Genius Grant,” for his work. In 2015, Xu collaborated with Foundertype, a Chinese font developer, to release “Foundertype Xu Bing,” a conceptual art-deco font that reorganizes the pinyin system (romanization of Chinese) into characters themselves. This work brought Xu Bing’s aesthetic ideas into the lives of the general public. 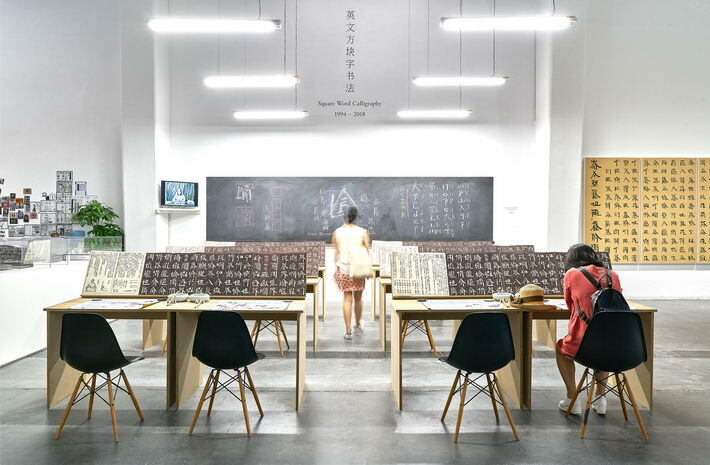 For the exhibition, Xu Bing created an installation piece modeled as an “adult literacy class” to serve the exhibition space with textbooks, an instructional video and calligraphy tracing books used in classrooms. As visitors enter the gallery, they also enter a “classroom.” Writing and watching videos create a more immersive experience. Square Word Calligraphy Classroom by Xu Bing, mixed media installation, dimensions variable, 1997. As visitors enter the “calligraphy classroom,” writing and watching videos create a more immersive experience. 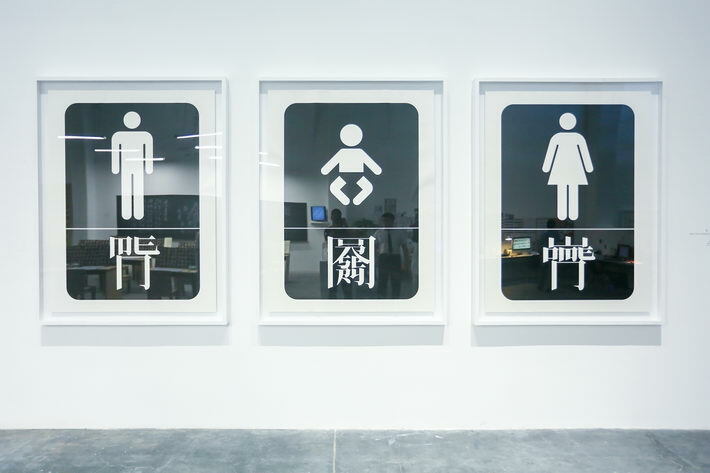 Square Word Calligraphy Sign: Men, Toddlers, Women by Xu Bing, silkscreen prints, 150.8 x 102.4 cm, 2003. Xu also embarked on a series of “cooperative endeavors” with non-human actors such as animals. Works like American Silkworm Series (1994-present), Panda Zoo (1998) and Wild Zebra (2002) all fuse Western form with traditional Chinese elements to address the frustration and excitement of transcultural contact. the cultural identity of contemporary China. A large-scale installation, Phoenix measures 28 meters in length and six tons in weight, making it too large to be placed in the exhibiting hall. So the exhibition only displays manuscripts and video materials of the work. Made of construction waste and abandoned tools, the work looks to a future built of recycled materials and their accompanying spirit, a familiar trope in both China and the world at large. Art for the People by Xu Bing, ink on canvas, 1,040 x 307 cm, 1999. Xu’s close scrutiny of society has helped him produce a new work every a few years as he works to break traditional boundaries of art.